Suman, 32 years of age, beams with joy when a Women on Wings team visits the workshop of Paper Wings in Bhondsi, Haryana. She works on creating a huge Christmas tree, made from old newspapers which are donated by corporate offices in nearby Gurgaon. Since four years Suman works at Paper Wings and saw her life change. Mother of two sons and married to Mahesh, Suman is a happy woman since she started making paper products for Paper Wings. Before that, her life was very different. Living in a traditional society, she was not allowed to step outside the house she shares with her husband, sons and in-laws. Suman shares: “My entire married life I never saw the sunrise from outside. Now I’m spreading my wings by making these beautiful products and earn an income. It is so encouraging that you come and like my Christmas tree. Before Paper Wings, nobody knew me, I lived only within the four walls of my house…”. Dreaming big for her children today. But Suman cannot recall her dreaming anything for herself when she was a child. “I was lucky my parents sent me to school till 10th class. But then it stopped and I stayed at home. Waiting to get married, have children and live with my in-laws. I simply could not imagine any other life. This is what all girls in our village do”, says Suman. But then smiles: “Creating this huge Christmas tree brings such joy. 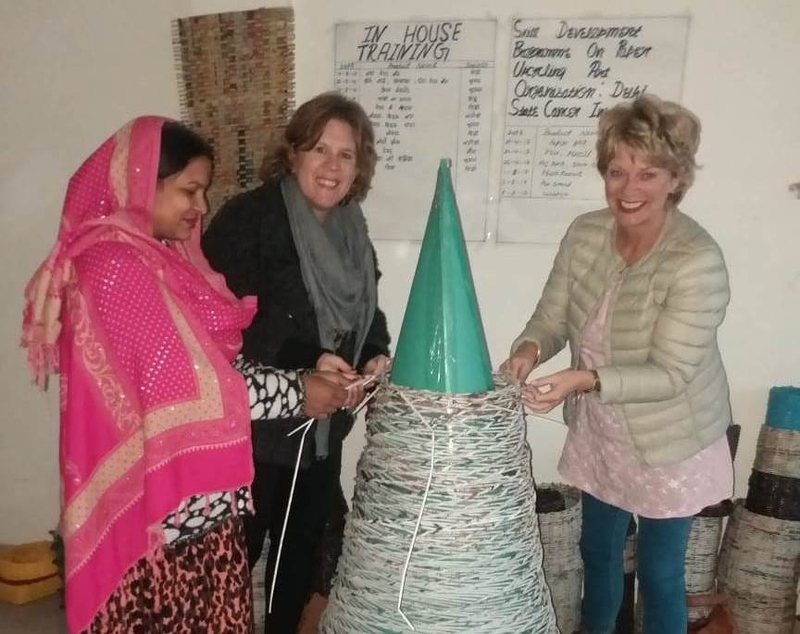 Let me show you how it’s done.” And Suman starts building the tree further, inviting the Women on Wings team to help her. Paper Wings is a community owned company of women in Self Help Groups (SHGs) from villages in Haryana. It is an initiative from Action Center for Transformation (ACT) which aims to achieve sustainable livelihoods by providing skill training and employment. It works on the principles of fair trade. The artisans get paid through to the bank accounts of the SHGs. It also promotes an eco-conscious society by upcycling and recycling waste which in return generates a fair income to the artisans. Women on Wings and ACT will partner on their joint goal of growing the company and thus the number of female artisans.